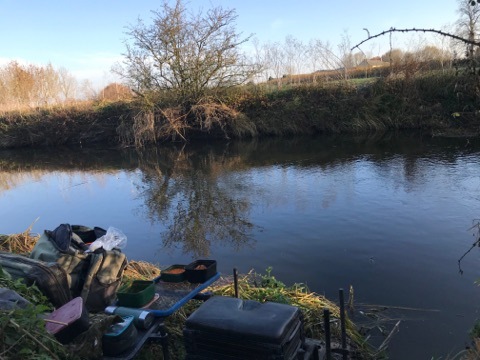 For round three I was intending to use North Bradon and Ashford, so on Saturday Rob, Steve and me met at Bradon and found four really nice swims, one of them took quite a bit of work but looked really good when we’d finished. We then headed to Ashford as there’s normally a few decent pegs there but it’s basically been decimated and didn’t look great at all, the trees have gone from the mill pond swim and the peg below the bridge and even the big bend looked a shadow of it’s former self. So without too many other options, we decided on using Midelney again. 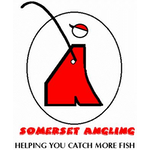 It’s just such a shame that three quarters of our water isn’t really fishable due to lack of access, pegs or fish! Sunday morning arrived and there was a definite chill in the air, winter is on it’s way! The usual suspects met at the bowling club for breakfast and when everybody had finished, I announced the draw. I really fancied Midelney again, partly because North Bradon was a bit of an unknown quantity but mainly because I’d enjoyed the last match there so much (I’d even mixed up some groundbait just in case!). 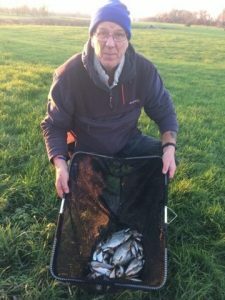 I was holding the bucket of destiny so once everybody had drawn, I asked Steve P to pull out the last ball for me and it had the number 95 on it which was the first one below the bridge at North Bradon, so my lovely groundbait would be staying in the bucket! Adie had drawn 96 below me, Dave had drawn the first one above the bridge which we’d spent ages working on yesterday and Parker ‘The Pole’ was on 90 which had looked really nice yesterday. At Midelney, Rob was on the first peg by the bridge and Leighton had drawn the peg where I’d won last time with Fieldy and Terry ‘The Toast’ on the other two. 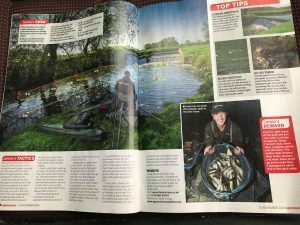 We’d just got to North Bradon, parked up and were unloading the cars when my mobile rang and as soon as I saw it was Rob’s number I knew what had happened and sure enough they’d got to Midelney and a pike angler with three rods out had pretty much covered the first three pegs! As only the first four swims had caught the last time we were there, nobody fancied sitting on the pegs further up so they headed to Hambridge and I must admit I didn’t give much for our chances against the pegs down there! 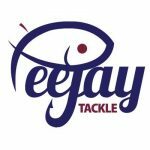 My peg looked really nice though, a big pool with some reeds at the top and a tree on the far side towards the tail of the swim, I’d only ever fished it once before and had struggled then, I do remember Dave Crouch winning the open from it with 9lb of roach many moons ago. Apparently pleasure anglers had reported catching chub so hopefully a few would put in an appearance today. I set up a 0.75 gram bodied float but plumbing up, it was nowhere deep enough in the middle of the peg although it was alright for by the tree and towards the bottom of the swim. For the deep water I set up a 1.5 gram DH13 bodied float with an olivette and a couple of droppers. On the side tray I had maggots, casters and Bait-Tech Super Seed Hemp. 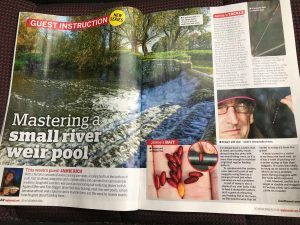 The start time arrived and I picked up the heavier rig, baited up with two red maggots and shipped out to five metres, just this side of the main flow down the middle. I was feeding casters and hemp just upstream and also across to the right of the reeds. I thought I might start catching some small fish but I never had a bite there, not even a minnow! I gave it five minutes before adding some more sections and going across on the other side of the flow at 11.5 metres. The float settled and then shortly after, disappeared from view, I struck and a 3oz roach was a nice fish to open my account. Next put in I had a minnow so switched to caster and had a 2oz chublet followed by another little roach and I was enjoying this, if I could keep catching these all day, a decent weight was possible. I should have know better as I then couldn’t get a bite! 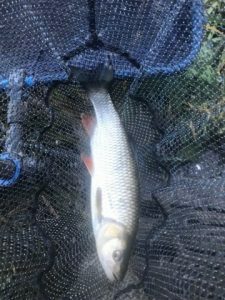 Nothing for ten minutes so I went back to double red maggot and the float buried, this was a better fish and a nice chub around a pound was safely netted, next chuck I had a little dace and it felt like there were a few fish in the peg. Another minnow meant a change back to caster but once again I couldn’t get a bite. We were now a couple of hours into the match, so I decided to have a go down by the tree and picked up the shallower rig, I added another section and went over to 13 metres, but the float just sat there, I even went to 14.5 metres under the tree, then worked my way up the far bank, I tried tight to the reeds and above them in a little slack but not a touch. 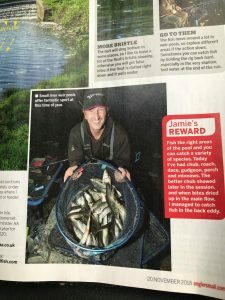 I always find situations like this very frustrating, you know there are more fish in the swim, dace don’t travel round on their own and there had to be more than two roach in the peg!, so where were they? Back out with the deeper rig at the top of the swim and I had what looked like a couple of knocks and then a decent bite resulted in another little chublet. No more bites for ten minutes and then a fish topped in the flow and I was just thinking about coming in closer when then float buried and this time a big fish was on, it didn’t give me too many problems and I slipped the net under a lovely chub getting on for 3lb, this was more like it! There were still two hours left and a couple more chub would give me double figures. I had a quick go in the flow where that fish had topped but I was soon going back across where hopefully another chub was waiting. 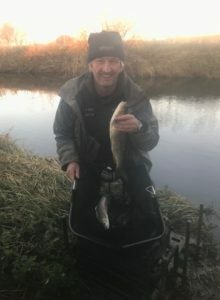 I missed a bite and I was sure there were more fish to be had, next chuck, the float’s gone again and I didn’t miss this one, it didn’t feel like a huge fish and I caught a glimpse of what looked like an 8oz chublet but then it somehow turned into a poxy trout! Nothing for ages and then I’ve hooked another fish and bugger me if it wasn’t another trout, this one around 10-12oz and I’ve had to chuck back over a pound of fish! Big Frank turned up to see how we were doing, he watched me catch nothing for a bit before going down to see how Adie was doing. I thought the others must be catching as nobody had been walking and there had been no phone calls. He came back and said Adie had caught a gudgeon in the first ten minutes and not had a bite since! He then headed above the bridge to see how Dave and Steve were doing. 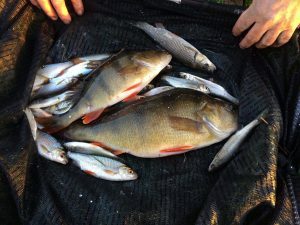 On his return he said, Dave had only caught a minnow and Steve had three chublets, it’s gutting, we’re trying really hard and all four swims looked lovely yesterday but seem to be devoid of fish but surely that can’t be the case? By the same token we can’t keep putting swims in that aren’t producing fish and I don’t know what to do next. 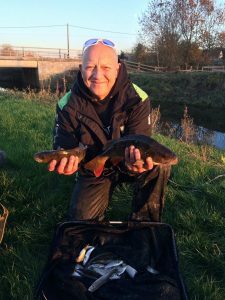 I never had another bite after that second trout, I packed up and went down to weigh in Adie’s gudgeon which was 1.5oz and then he returned the favour and my fish went 4lb 7oz. Dave didn’t weigh and Steve’s chublets went 1lb 12oz so I secured one point for the league and took a nugget off of Steve. 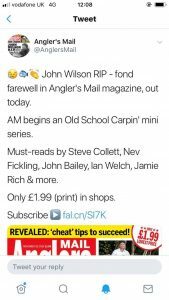 My second feature with the Angler’s Mail was out today, another brilliant day’s fishing and I think it came out really well so a massive thanks to Brian Gay once again. I even got a mention in a tweet alongside such legends as John Bailey and Nev Fickling which is very surreal!